Earlier this month, USA Today reported that Donald J. Trump cheated hundreds of former employees and contractors by refusing to pay them for work they performed. The article detailed the demise of a family-owned cabinet making company in Philadelphia, Edward J. Friel Company, because Trump only paid back $83,600 of his $400,000 bill. The New York Times detailed on Saturday how he paid himself millions with his Atlantic City casinos while failing to repay his bondholders. Since Trump has promised to bring his business know-how to the White House, his behavior as a businessman could offer a glimpse into what he would do to our nation’s economy as president. In fact, Trump, who has referred to himself as the “king of debt,” has already threatened to default on the national debt. The businessman suggested that he could “make a deal” with American creditors to avoid paying them back fully — all the while trying to add an additional $9.5 trillion (over 10 years) to the national credit card by slashing taxes for the top 1% of Americans. Defaulting on the national debt — as Trump has proposed — would be a catastrophe. U.S. debt is used throughout the world as the safe, “riskless” asset and President Trump’s open flirtation with default would cause interest rates to rise as buyers of U.S. debt would require extra money to compensate them for the new risk. This would also have a tangible negative impact on American families. Higher interest rates would hurt middle-class Americans many of whose credit card, mortgage, and student loan interest rates are tied to the interest rate on U.S. debt. And it would cause a massive reduction in the value of U.S. debt, most of which is held by Americans. The full impact this could have on the jobs, wages, incomes, and wealth of Americans is impossible to quantify completely. Instead, we provide two brief illustrations of how Donald Trump’s recklessness could impact middle-class families and the economy. Donald Trump’s agenda of higher debt and default would make the economy more risky, which would raise interest rates as lenders would demand extra money to compensate them for extra risk. We illustrate the potential impact of a modest increase in interest rates of 1%, 3%, and 5% — interest rate increases that could happen in the case of a credible threat to default or a short default period. Large defaults such as those that occurred in Greece and Argentina — the last two major countries to default on their debt — raised interest rates as high as 50 percent. We also ignore the potential fallout of a financial crisis that could be far more devastating than what occurred in 2008. Housing prices would tumble. Most Americans’ wealth — if they have any — is the equity in their home. If Trump defaulted on the national debt, he would wipe away trillions of dollars in middle-class housing wealth as interest rates would rise since borrowing in the U.S. would become inherently riskier. The higher interest rates would make it more expensive for people to buy a home, thus reducing the value of houses since there would be fewer buyers and those that could still buy would have lower purchasing power. Below we illustrate what could happen to house prices if President Trump threatened to default or defaulted for a short period on the nation’s debt. A recent study by economists at Harvard and Wharton (Donald Trump’s alma mater) allows us to estimate the change in house prices that would result from an increase in Treasury interest. We use the median price of a newly sold home — $296,400 in 2015 — to illustrate the potential effect on a typical homeowner. 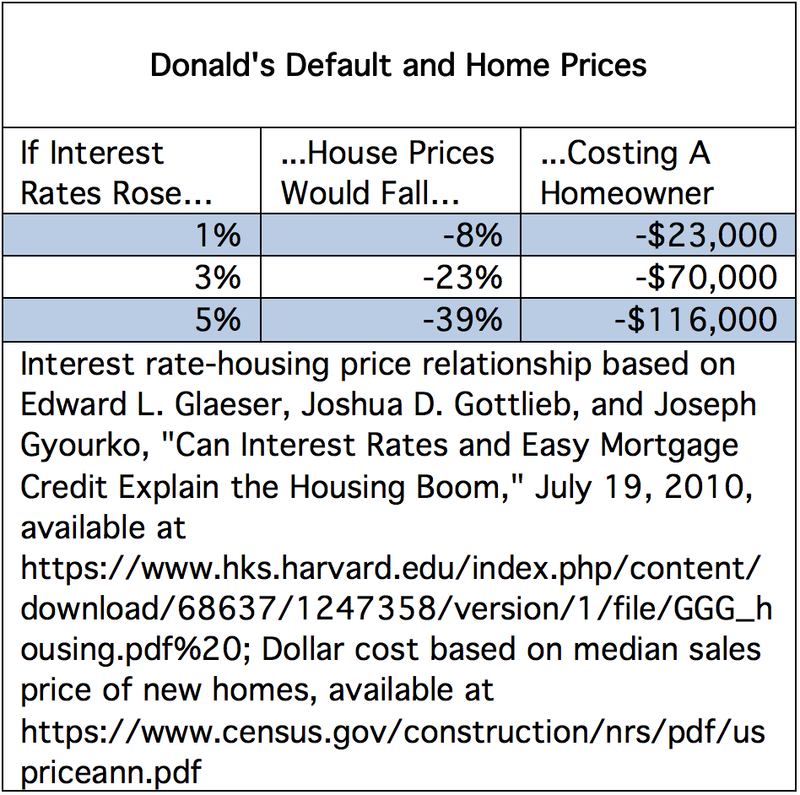 Trump’s default could easily end up costing a typical homeowner $100,000 and potentially much more in the case of a full-blown default and financial crisis. The economy could lose more than 3 million jobs. Trump’s default would easily launch us into another recession if not a full-blown financial crisis by causing interest rates to soar. Higher mortgage interest rates would devastate the construction and real estate industries as higher auto loan interest rates would do to the auto industry. Businesses would find it less affordable to borrow to purchase equipment, making them less likely to hire. Consumers’ higher interest rates on their credit cards would make them less inclined to purchase goods and services. 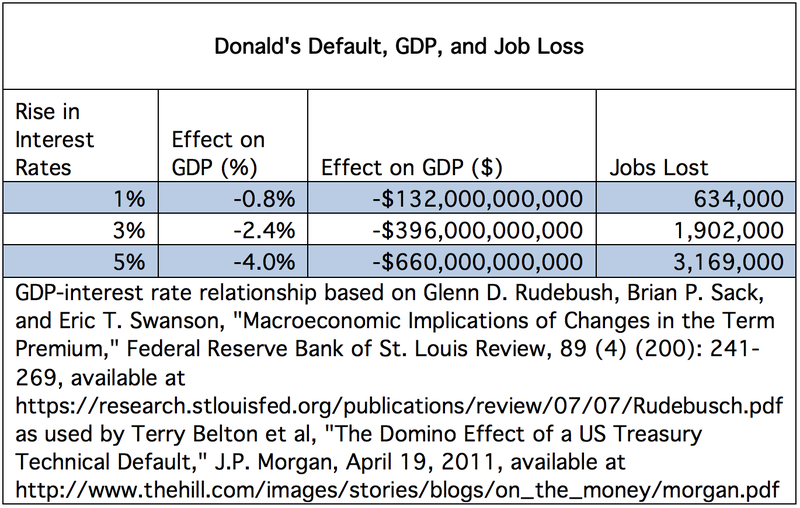 Donald’s Default could easily cause a recession, destroy billions of dollars in economic activity, and kill 3 million jobs. And, again, this assumes a relatively modest increase in interest rates and leaves out the effects of a financial crisis. Political commentators have suggested that Americans shouldn’t pay attention to Trump’s words and statements, since he has repeatedly flip-flipped on other issues in ways that make it difficult to know his true agenda. But it is worth noting that Trump’s reckless economic agenda strongly compliments the reckless agenda of the GOP Congress. And with the need for a debt ceiling increase in 2017, a debt crisis could be one of the first consequences of a Trump Presidency. Brendan V. Duke is the Associate Director for Economic Policy at American Progress Action. His research areas include macroeconomics, corporate behavior, economic inequality, and intergenerational economic mobility.